Posted October 25th, 2018 & filed under Charity, Promotions. We are big fans of animal shelters. Always have been. And here in St. Louis there are many great ones to choose from. We also happen to be fans of beer. 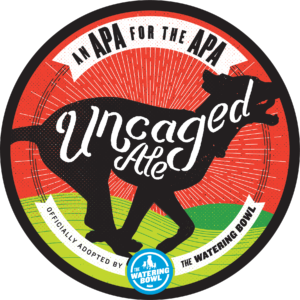 So, we reached out to our favorite independent craft brewer and our friends at the APA of Missouri to release a special beer we dubbed Uncaged Ale. In case it’s not obvious, a portion of proceeds from this APA for the APA go to our friends and neighbors at the APA. They do amazing work, and this is a chance to raise a pint to all they do here in St. Louis and outlying rural areas. Our own founder, Jeremy King, adopted his dog, Aspen, from the APA. He especially appreciates the fact that they reach out to shelters in places like his hometown of Cuba, Missouri where they have fewer resources. They’ll actually pick up dogs from those places and bring them here where there’s a larger staff and a larger pool of adoptive pet parents. And partnering with Schlafly is a perfect fit. The largest locally owned, independent craft brewer in St. Louis has a long history of supporting the neighborhoods they live in. And we’re proud to help them reach out to dogs and our amazing cage-free canine community. So, even if you’re not in a position to adopt a dog during Adopt A Shelter Dog Month, you can still help out by adopting a new beer. Look for it at your favorite neighborhood watering hole (see what we did there? ), and/or make a special trip to The Schlafly Tap Room or Bottleworks Brewpub, just down the road from our Dog Grove location. When you spot it in the wild, make sure you snap a photo @TheWateringBowl and use #APA4APA. We’ll be randomly selecting winners for TWB giveaways to show our appreciation for spreading the word. And now, we’re offering a fundraising T-shirt that shows your love of dogs and your appreciation for amazing beer. Ask about it next time you pick up or drop off. All proceeds from the sale of these t-shirts will go directly to the APA. Buy a shirt, rescue a dog. So, lap it up, and join us in raising a glass to our friends at the APA. No way! Pour one out for me homey!